Chelsea 1-1 West Ham - We are our own worst enemy as the Europa League beacons. Chelsea took on West Ham at Stamford Bridge knowing that only a win would do as we look to cling onto our hopes of a top four finish. We blew it once again as the game finished 1-1. Alex Churchill writes this match report. Us: Christensen didn't train this week so we get Cahill - well at least a section of our supporters will have someone to blame for everything that goes wrong, I said. Them: I honestly couldn't pick most of their line up . I would have been better of reading the Review of 1xbet rather than try and name all of their players! We started off with a tribute to Butch. The applause went on so long it confused the players. West Ham have literally no class, but nigh on every single one of their fans applauded with us. Thank you. You're Not West Ham Anymore. Our first half-chance came at range from Willian on two minutes but it was blocked easily. Eden almost sneaked it in the far corner a minute later but no joy. At the other end nothing from them. They might have got out of their own half once in the first five minutes. They were time-wasting already. Whichever moron ever thought that David Moyes could have managed Manchester United belongs in a padded cell. But then things improved. On 21 a corner from Willian didn't quite come in at the right height. Morata was a mile offside when scored on 23, or so it looked up in the Shed, but at least they were properly running at them now. He'd already annoyed me by chatting happily with the defender marking him. I'd have given this game to Giroud, because he stands up better against pestilent, meathead defenders and at least if he got caught offside he'd still be fighting. These, for me, are the games we bought him for. There are times when I remember Costa running at keepers on the slimmest of opportunities with a look of beast-like lunacy and I miss it. Thin Costa. Not fat moany Costa. Because our selective memories have largely forgotten the latter. Good move on 28, involving Morata, but the ball ended up skimming agonisingly across the face of goal and Willian was just too far away to poke it into an empty net. Shooooooooot we all yelled at him on the half hour and from twenty yards Little Willy did, but it was just wide. This might well have been the longest half hour of my life. Since last Sunday. We were in on 35 minutes only for their Goalkeeper, who got his foot on it at the last. It was ok though. Because moments later we finally scored. Alonso was basically playing up front with Morata, they were awful going forward. But chances were few. 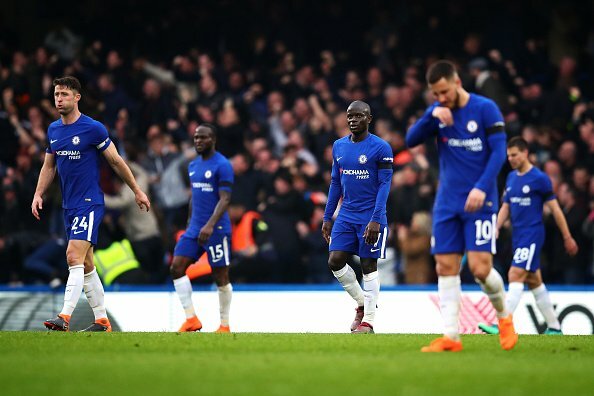 A minute after the break we could have doubled our lead when Willian and Hazard emerged from some tippy tappy stuff in the box and the former stabbed the ball painfully close past the far post. We looked even more at it. They looked even worse. Cahill. Yes CAHILL set us off in another run on 49, there were was a brief interlude when Moses lost the ball and had to win it back again, then the final effort went into the hands of the reborn Joe Hart in their goal. Then yet again with the ball across the face of it, and who ran into it finally? Moses. The ball went over the roof and caused a half an hour delay on the District Line when it landed on the tracks. Apparently. They had been awful, but we were still only one goal ahead and right now I don't trust us. A header from Morata went over the bar on 54. On 58 we saw a great ball in by Willian, Morata smacked it home. Again. And apparently he was offside. Again. To give him his credit, he had got more physical as the game went on. So he was running at about 60% of how mean and nasty I personally would like to see him on a football pitch. They started the ball rolling with the substitutions. Patrice Evra. 66: Oh Eden! Should have passed to Willy in the box! A couple of minutes later Moses almost scored a blinder from out on the right but it was just wide. Are you seeing a recurring theme here? 70 minutes and dare I say the wind had gone out of our sails slightly. This is why we have substitutions in football. Nobody has told Antonio Conte. In his world you wait until it's redundant. It's like realising you've got a load of shrapnel in your pocket ten minutes from closing in a bar and buying a random round of shots that nobody really wants that have no purpose other than to spend money for the sake of it. Their goal was Gary Cahill's fault. I will let you have this one. Be gracious and espouse your torrent of effluence upwind from me, because I have too much respect for him to flog it to death. 16 attempts. One goal. That's the bigger problem for me. On 76 minutes Pedro and Giroud were ready to come on, the time wasting was criminal and West Ham looked like Brazil in 1970. A save by Thibaut on 77 kept us in it. No. You haven't read that wrong. Commence meltdown. On 78 there was another reaction save from Joe Hart from Giroud (He reverted back to negative warp speed after they equalised) When Marc Noble is robbing the ball off you, you know you're in trouble. On 85 Cahill was beaten but Kante bailed him out. Another break for us, another shot straight at the keeper. Aaaaaaargh! Antonio has got his hands in his pockets again. He's being outwitted by David Moyes, who couldn't outwit my kitten, and he's got his hands in his pockets. 87 minutes saw another flying save from Joe Hart then more lying on the floor from them before we could take the corner. There better be a minimum of five minutes added on to this. And there were. Another corner, another one of them lying on the floor. Referee is once again oblivious to cheating. But once again when we finally got to take it it was no not good. Cahill's header was on target but the Hart claimed it with ease. So: Still not clinical enough, we are our own worst enemy. We are not worthy of the Europa League at this point. Someone is going to have to explain the me why I hear so many people digging Eden Hazard out as the main perpetrator on the pitch, because I just don't see it. He has a tendency to disappear late on if we're collectively awful, but don’t they all? He's not got one foot out of the door to Real Madrid. He's got a dream to play in Spain before he dies and the press won't leave it alone. For me the manager is rubbing off on the players, who are not blameless by any means but negativity rolls downhill and it's what you get for wanting to be the man in charge. Ugly, cold hearted responsibility. We are not the sum of our individual parts, and it can't be that every single player is suddenly rubbish. Most of them won the league last season, though a lot of them could do with a course in football under the tutelage of Roy Keane this summer. Cahill and Azpilicueta were screaming at each other today. And not over the West Ham goal. These are two of the nicest, most professional men in football. Probably too nice. And then Thibaut gets involved. He never speaks to anyone. And there they are yelling at each other. This is what we have become. Written by Alex Churchill. AC.